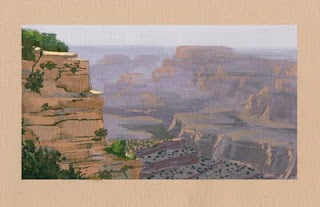 MauSketch - The Art of Mauricio Abril: The Grandest Canyon of Them All!!! The Grandest Canyon of Them All!!! I just came in a few hours ago from spending a long weekend at the Grand Canyon National Park in Arizona. It was my second time and I still cannot describe its beauty in any words that could do it justice. All I can say is it's breathtaking and a must for any fan of natural wonders. Being an artist, I just had to separate from my friends for a few hours and do at least one painting. 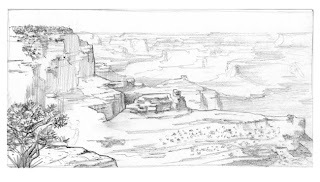 After all, how many chances will I get to paint the Grand Canyon FROM LIFE? So I sat down and did a little gouache sketch in my sketchbook. Earlier at a different viewpoint I had done a pencil sketch while the rest of my group was taking pictures. The atmospheric depth the canyon creates is just unbelievable, and I just had to humbly try and capture that impression for myself. It was quite amusing, too, how many fellow tourists would look over my shoulder. I had never felt so self-conscious while painting in my life, especially during the lay-in stage. I kept wishing I could tell them - "don't worry, it'll look better later...hopefully." A few people asked permission to photograph my painting and myself painting it, with which I had no problem. It still makes me laugh to think that in multiple hard drives and albums across the world, there's a random picture of random me and my simple painting amongst the rest of their vacation photos. Great job, I would have done the same thing. How many chances are you gonna get to paint the Grand Canyon from life? That's a very nice color painting, Mauricio. That's the gouache sketch? Very impressive. I love northern Arizona. It's been a long time since I've been there, but I saw the Grand Canyon twice. Was It clear when you were there, or is it always kind of hazy like when I saw it? It takes a lot of atmosphere to fill that wide canyon. NICE! great opportunity to paint and draw from life. in all places the grand canyon. great painting!! :) and love that story as well...good for you to sketch when everyone else was taking pics, and taking advantage of the opportunity!